Here are photos of the most beautiful remote-controlled designer ethanol fireplaces with active safety measures. With AFIRE’s tips, create a high-end remote-controlled designer fireplace for your living room. A magnificent ventless ethanol fireplace can be installed in any room, without any constraints. Decoration is no longer created around a fireplace; remote-controlled ethanol burners are rather being integrated into decoration. The whole becomes much more harmonious. New concepts are seeing the light of day: ethanol fireplace and television, fireplace table, shelves or cabinets with embedded ethanol burner, ethanol fireplace built into a partition wall, etc. The world of design has come closer to the world of the fireplace with automatic, remote-controlled and secure ethanol fireplaces. Simple to install and use daily, they allow for the creation of all kinds of fire spaces. The designer now holds the balance of power: he can create any decoration that includes a customized fire point. To do so, he has two ranges available to him: embeddable ethanol burners or the most beautiful AFIRE designer ethanol fireplaces ready for use. A fire space is no longer an object to be imposed on interior architects, rather, it is today an integral part of their conceptions. All styles are allowed. 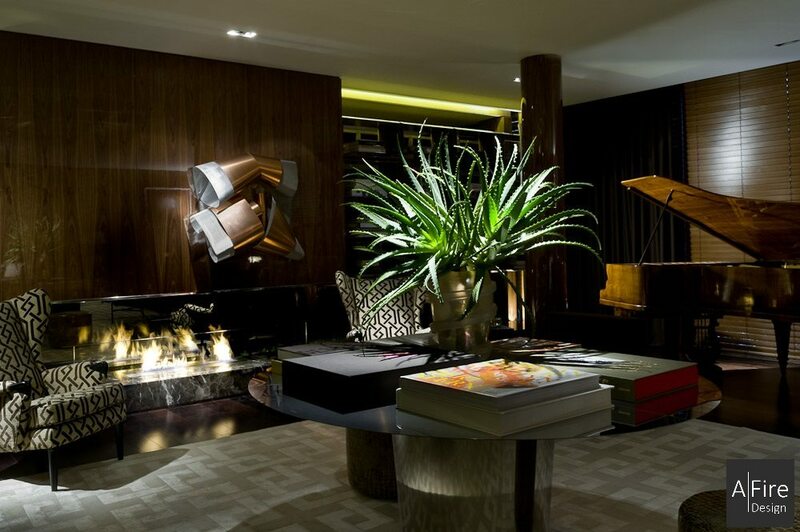 The most beautiful ethanol fireplaces become the fruit of the imagination of interior designers. The possibilities of fire places or fire objects are limitless (provided, of course, that the standards of use are respected). What’s most important to create a high-range exclusive designer fireplace is to give free reign to the imagination and to follow instincts. A fireplace is conceived as a part of a general decoration. Fire will magnify the space and give it an inner live. However, fire is no longer the primordial element of a room; it is at the disposal of the user’s welfare. The user decides. Fire, like all the other objects in the room, is at his service. The most beautiful designer ethanol fireplaces are free from any constraints. They are controlled by touch and sight at the will of the user. All of AFIRE’s devices are fixed or embedded in their decoration. They are smart fireplaces with automatic active electronic safety devices. Light the fire!